Always wanted to own a perfect grass-cutter that would cut all the grass around in a satisfying manner ? Now you have opportunity to do it! 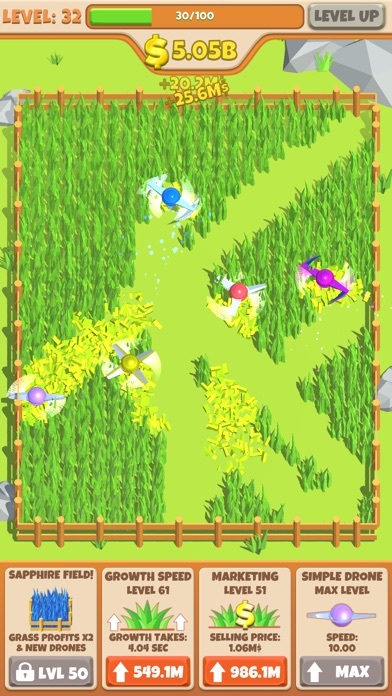 Buy tons of colorful grass-cutters you have always wanted in our brand new grass-cutter idle game. Best contemplative gameplay ever. If you want cut some grass by yourself don't stop just do it! 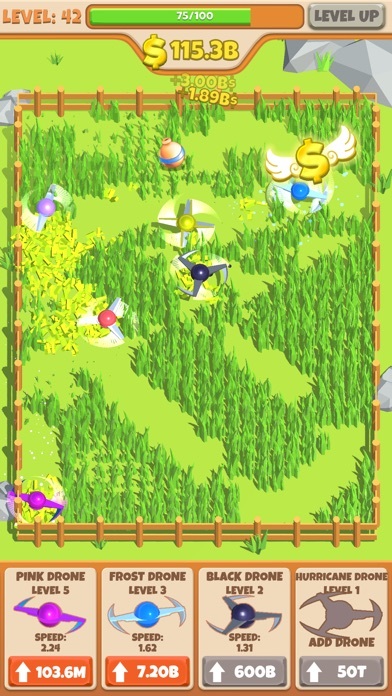 So when I first saw this game in a add I thought this game is boring but I had no other good games so I got it and when I first started I thought it was really good then now I have every single drone there is and every field except the rainbow field and that’s because it hasn’t come out yet but as soon as it does I’m going to dominate l!! This is a great game, I am finished with every level and i am in need of some more! Please are you up with those updates, I’m waiting! This game is super addicting, but I beet it in a few days. There is a “Coming Soon”. I can’t wait until it updates!! It’s a really fun game but needs more updates so you can get better things. It also says that you get new drones when you upgrade the field but they are all the same drones. Much wood could a woodchuck chuck if a woodchuck could chuck wood? I am level 342 growth speed. And level 275 marketing. I beat the game in less than a day and still play it to upgrade such and such. There is a lack of content at the moment, I wish the creators would bump out more. A lot of bugs when you get higher levels. The little grass cut bombs seem to glitch out when you are at 0.06 grass growth, they will pop several times. Ads don’t work when trying to get x3 rewards. Won’t let me click the x button to get my reward and when it does end up working I don’t get the reward. I hope updates come soon. I been plying for only a couple of hours and I have already beat it you need to update it and I will keep playing I have it a three stare because it was way to easy to beat and there is not enough that I can enjoy the game. I beat this game the first day I got it. Six days since the last update . 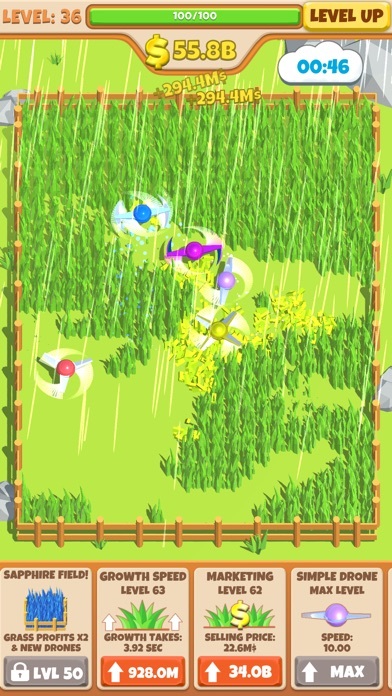 Literally all you have to do is add a bigger field with a new multiplier with rainboowws. And like, maybe two drones. “Its harder than it looks” Literally all they need to add is a recolor and a redesign. Like a lot of other reviewers I fell in love with the simplicity of this game. In about 2 days I got up to owning everything and have upgraded all of my bots. I don't know exactly what my revenue per cut is but I know my regrow time is 0.08 seconds... Basically instantly. I'm up in the 170s in terms of rank and keep hoping that I'll wake up and see an update, and every day I wake up and am immediately disappointed. 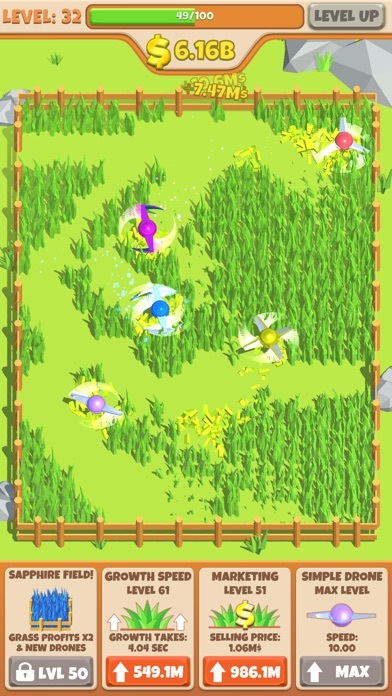 I would love to see an update that adds more grass styles and bots. Also more levels for the boys, it's too easy to max them out at 30. Maxed out in a couple hours. Can you tell us when you plan to update it? This game is such a good way to waste time and relieve your boredom. However, I completed the entire game in a few days. I have been waiting forever for an update to add more to the game but every update since has just been “Bug Fixes.” I wouldn’t be surprised if I and many others end up deleting the app while waiting for an update. It’s so much fun, but not when you can’t do anything! Got this game 2 days ago and already finished the game. Too many forced ads and there is this weird glitch that every time there was an ad, the game would freeze and I would have to reload it. This wouldn’t be a problem if it were not for there being an ad in every action you do. You bought a new drone? Ad. You upgraded anything? Ad. You level up? Guess what? Ad. Obviously this game is not near done, I have no complaints about that, and honestly, I’m excited for the update. 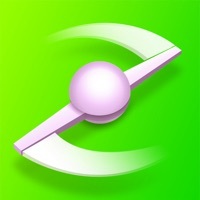 This game is addictive, and easy to play, whilst being very satisfying. 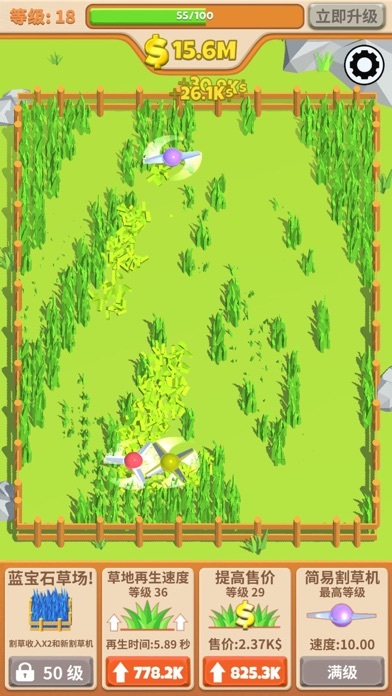 Call me boring, (or perhaps stoned...), but when I first got this game I stared at the grass cutting for about an hour. In a few days, I had reached level 100 and was about to purchase Rainbow. Welp, now I’m still here, with all drones maxed, and my growth speed down to 0.09. I’ve reached a point where I’ve realized there is no such thing as FF currency, as my money keeps being made, and price going up. I am still able to purchase upgrades, but the currency counter is broken. Hope the update comes soon. Wish there was a new update! I played this game straight for a day and a half. In that time I got sick of the ads and payed $1.99. That being said, I am encroaching on level 200...I am at GG on money and have hit the developers road block. I fear they may be attempting to roll out an “update” that will do the same thing as BOS 2 Billionaire Simulator. I spent a decent amount on BOS2 to have an update crammed down my throat that forced me to repurchase things. The game went from a cool past time killer to cash grab. If the developers go this route...then avoid even installing. You’ll reach level 100 SUPER FAST and cannot progress. There should’ve been at least 1000 levels to begin with before waiting for an update. I have waited for over a week. That tells me that this game WILL turn into another cash grab. And you’re still running forced ads? Deleted immediately. There’s only 3 levels. I paid for no ads at level 3. No warning you go to level up to 4 and it’s “coming soon.” DO NOT PLAY AN DO NOT PAY. I’m level 154 grass grows .13 of a second and my market is level 255 it’s getting boring and still waiting on this update. It’s definitely a ⭐️⭐️⭐️⭐️⭐️ time waster game if this update happens I’ll change it to a five star review.